Rev. W. Lees Bell M.A. Passing down the river eastward of Horsleydown, and across St. Saviour?s Dock, we reach another island district of Bermondsey. This small but densely populated place was once intersected by streams and canals like a little Amsterdam, and has been known for centuries as “Jacob’s Island”. it is difficult to write the history of a place which seems to have no marked commencement and where half the property has no title deeds, but what history it may be said to have commences with the reign of Queen Anne. The map of Horsleydown mentioned in the last chapter contains a piece of ground on the west of St. Saviour’s Dock described as “Jacobbe’s Garden” and hence “Jacob’s Island” on the east of this dock may be supposed to have had the same owner. 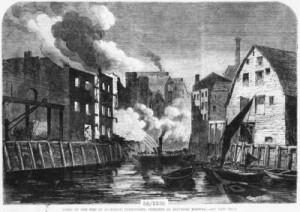 The boundaries of this district on the west and north are St. Saviour’s Dock and the Thames bank, which here begins to be called “Bermondsey Wall.” On the south it is bounded by Dockhead and the road towards Rotherhithe,whilst on the east it is encircled by a tidal stream called the Neckinger. This Neckinger river has for centuries contributed to the commercial prosperity of Bermondsey affording water-power to various mills and supplying the tanners with what their trade requires. The meaning of the word “Neckinger” cannot be ascertained, and the various interpretations it has received are in no case satisfactory. In ancient times it was a tidal stream from the Thames to the Grange and bore fish and other produce to the Abbey. It remained open till within the last thirty years, and though now covered still brings the Thames water to the “Neckinger Mills,” the extensive tanneries of Messrs. Bevingtons. Another small river now covered in, called “Mill Stream” ran close to St. Saviour?s Dock, and found its exit to the Thames, toghther with the Neckinger, at the bottom of the present Mill Street. The most ancient record of the district is in one of the last deeds executed by the Abbot of Bermondsey, and relates to a Mill in that corner of the island near St. Saviour?s Dock,demised to John Curlew in 1536, for grinding purposes. Here were the sluice gates by which the Thames water could be admitted or excluded, and various litigations have taken place from time to time respecting the repair of these sluices. It is customary to attribute the wretched aspect of the place in past years, to the protracted Chancerysuits which these disputes gave rise to, but other causes were at work to make men leave their holdings, or enabled them to hold without a title. Jacob’s Island was reached by wooden bridges which connected it with the surrounding thoroughfares. These thoroughfares were always filled with traffic, and Mill Street was originally the only road towards Rotherhithe from Horsleydown. But the approaches to the island were narrow and secluded, and came at last to be the harbour of every kind of vice and wretchedness. One of these known as “Hickman’s Folly,” still continues to be the abode of poverty. This narrow street once known as the “Bermondsey Follie” takes us back in thought to Queen Anne’s days, when this French word “follie” was first used in England to indicate a ‘place of pleasure,’ and there is some tradition that in ancient days a public garden existed in the island. It was this condition of things that provoked the vehement expostulations of Charles Kingsely and the strong articles in the Morning Chronicle. But what popular writers and newspaper articles could not do the Cholera did, and in 1850 the crazy houses were pulled down, the ditches or canals filled up, and the Mill Stream and Neckinger arched over. As may be expected it was not done without opposition and demands for heavy compensation. But happily it was done; and Jacob’s Island, as such exists no longer. Mill Street, Jacob Street, London Street, the Folly, still exist, but the quaintness of their poverty is gone, though plenty of poverty remains.- Jacob Street once had curious old houses which have since given place to modern buildings. Some houses are still to be found with cellar below cellar, and indications of secret passages to the river – reminders of the time when smuggling was not only practised but connived at. There still exists also an old mansion known as “Bridge House,” on whose carved portal may be seen the data 1700 – the period when the Island was first built over. The spiritual state of Jacob’s Island must have been about the same as its sanitary condition. But things improved, and at length Jacob’s Island with some of the poorest of the adjoining neighbourhood was made into a separate parish under Sir Robert Peel’s Act. In 1848 Christ Church was consecrated. It is Romanesque in style, the rose window and three lights of the Chancel being copied from the Norman Church of Barfreston near Dover. Improvements were made in 1878 when the pulpit was moved and choir stalls were added. Evangelistic work is carried on amidst a population of 6000, and the profit on this sketch of Bermondsey will be devoted to parish purposes.